If there is still any doubt that Lennon and McCartney are the greatest song writers since Schubert, then next Friday—with the publication of the new Beatles double LP—should surely see the last vestiges of cultural snobbery and bourgeois prejudice swept away in a deluge of joyful music making, which only the ignorant will not hear and only the deaf will not acknowledge. Called simply The Beatles (PMC 7067/8), it's wrapped in a plain white cover which is adorned only by the song titles and those four faces, faces which for some stili represent the menace of long-haired youth, for others the great hope of a cultural renaissance and for others the desperate, apparently endless struggle against cynical so-called betters. In The Beatles' eyes, as in their songs, you can see the fragile fragmentary mirror of the society which sponsored them, which interprets and makes demands of them, and which punishes them when they do what others reckon to be evil; Paul, ever-hopeful, wistful; Ringo, every mother's son; George, locai lad made good; John, withdrawn, sad, but with a fierce intelligence clearly undimmed by ali that organised morality can throw at him. They are heroes for all of us, and better than we deserve. It's not as if The Beatles ever seek such adulation. The extra-ordinary quality of the 30 new songs is one of simple happiness. The lyrics overflow with a sparkling radiance and sense of fun that it is impossible to resist. Almost every track is a send-up of a send-up of a send-up, rollicking, reckless, gentle, magical. The subject matter ranges from piggies you seen the bigger piggies / In their starched whit shirts'), to Bungalow Bill of Saturday morning film-show fame (`He went out tiger hunting with his elephant gun/In case of accidents he always took his mom'); from `Why don't we do it in the road' to Savov Truffle. Electronic gimmickry has been suppressed or ignored in favour of musicianship. References to o quotations from Elvis Presley, Donovan, Little Richard, the Beach Boys, Blind Lemon Jefferson ai woven into an aural fabric that has become the Ba: Tapestry of popular music. It's all there, if you list< Lennon sings 'I told you about strawberry fields' a `I told you about the fool on the hill'—and now? The Beatles are competent rather than virtuoso instrumentalists—but their ensemble playing is intuitive and astonishing. Thev bend and twist rhythms and phrases with a unanimous freedom that gives their harmonic adventures the frenzy of anticipation and unpredictability. The voice—particularly that of Lennon—is just another instrument, wailing, screeching, mocking, weeping. There is a quiet determination to be rid of the bogus intellectualization that usually surrounds them and their music. The words are almost deliberately simple-minded—one song is just called 'Birthday' and includes lines like, 'Happy Birthday to you'; another just goes on repeating `Good-night'; .another says 'I'm so tired, I haven't slept a wink.' The music is likewise stripped of all but the simplest of harmonies and beat—so what is left is a prolific out-pouring of melody, music-making of unmistakable clarity and foot-tapping beauty. The sarcasm and bitterness that have always given their music its unease and edginess still bubbles out—'Lady Madonna trying to make ends meet—yeah/ Looking through a glass onion.' The harshness of the imagery is, if anything, even harsher, 'The eagle picks my eye / The worm he locks my bone.' Black birds, black clouds, broken wings, lizards, destruction. And, most grotesque of all, there is a terrifying track just called 'Revolution 9’, which comprises sound effects, overheard gossip, backwards-tapes, jangling from the subconscious memories of a floundering civilization. Cruel, paranoiac, burning, agonized, hopeless, it is given shape by an anonymous bingo voice which just goes on repeating 'Number nine, number nine, number nine' –until you want to scream. McCartney's drifting melancholy overhangs the entire proceedings like a purple veil of shadowy optimism—glistening, inaccessible, loving. At the end, all you do is stand and applaud. Whatever your taste in popular music, you will find it satisfied here. If you think that pop music is Engelbert Humperdinck, then the Beatles have done it better— without sentimentality, but with passion; if you think that pop is just rock 'n' roll. then the Beatles have done it better—but infinitely more vengefully; if you think that pop is ntind-blowing noise, then the Beatles have done it better—on distant shores of the imagination that others have not even sighted. This record took them five months to make and in case you think that's slow going, just consider that since its completion they've written another 15 songs. Not even Schubert wrote at that speed. other featured a new recording of the film's orchestral score composed by George Martin. In addition to two hit singles from 1966 and 1967, side one presented four previously unreleased Beatles songs that were first heard in the movie. There was a plan to make those songs available on a seven-inch EP running at LP speed, which would also include another unreleased track, Across The Universe'. Although a mono master tape for the proposed record was compiled in March, 1969, the EP was never pressed. When Yellow Submarine arrived in the shops, `The White Album' was still at number one. On the British LP sleeve, Apple press officer Derek Taylor encouraged record buyers to purchase that recent album by introducing a review written by Tony Palmer. 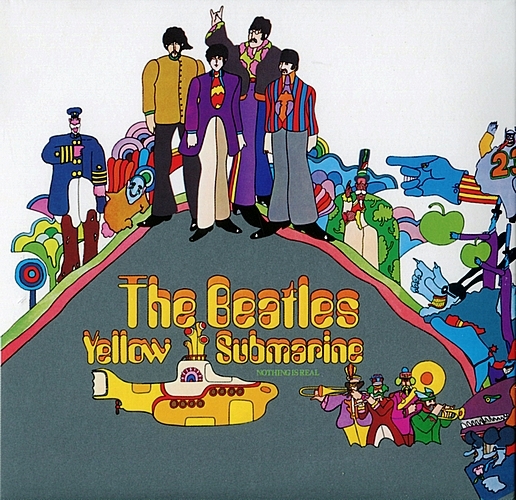 The US release of Yellow Submarine had different sleeve notes written by Dan Davis, who traced the heroic roots of the cartoon characters in the movie. Although never intended to be a high-profile Beatles release, the album reached number three in the UK and stayed in the Top 15 for ten weeks. In the USA, while 'The White Album' held at number one, Yellow Submarine reached its highest placing of number two. Its initial chart run in 1969 lasted for 24 weeks. 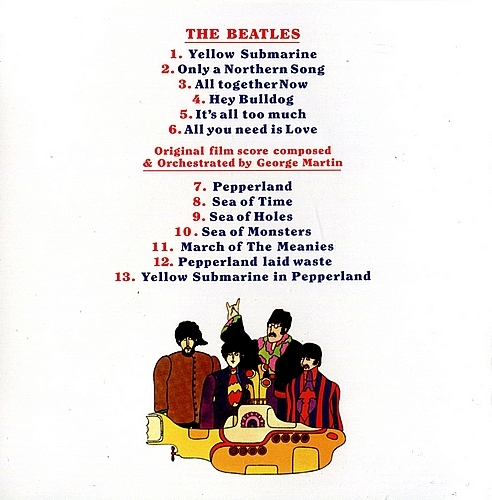 The four`new' Beatles songs included on side one of Yellow Submarine had, in fact, been recorded a lon gtime before the album's release in January, 1969. Three came from 1967 and `Hey Bulldog' was completed in February, 1968. The most recent recording on the LP was the film score on side two, which George Martin had re-recorded with an orchestra of 41 musicians in Studio One of Abbey Road in October, 1968. The songs that were introduced on Yellow Submarine were made in the period when only four-track tape machines were available to the group in Abbey Road. That was fine for 'All Together Now' and `Hey Bulldog', which were confined to four tracks. However, the other two songs required extra tracks and the usual method was to create them by `bouncing down'. This process involved copying the first reel's completed four tracks to a new tape and simultaneously combining some of them to leave free as many tracks as were needed for additional overdubs. 'It's All Too Much' was begun and then 'bounced down' to a second tape at De Lane Lea Studios. Following a repeat of this process to a third four-track at Abbey Road, more overdubs were added so thatnine tracks were used to complete the song. In contrast, using just one four-track tape, `Hey Bulldog' was recorded, overdubbed and mixed in a single ten hour session. Track one had drums, piano, guitar and tambourine; two contained bass, guitar and off-beat drum with reverb; a double-tracked vocal and guitar solo were on three; and the final track included John's lead vocal with Paul singing a backing vocal and an additional guitar solo. Dating back to the sessions for Sgt. Pepper's Lonely Hearts Club Band, `Only A Northern Song' had been recorded in a unique manner. Abbey Road's technical engineers had discovered a way of controlling the speed of two four-track tape machines so that they ran in perfect synchronisation. With no need for `bouncing down', eight tracks were simultaneously available. Tape one consisted of bass, trumpet with glockenspiel, drums and organ and the second tape featured effects, piano, vocal and double-tracked vocal. However, problems arose during mixing when, as the play buttons were pressed on the two machines, it became a process of trial and error whether they would, in fact, start at exactly the same time. It was such a haphazard and time consuming process that only a mono mix was completed and as a result an artificially enhanced - or fake — stereo version had to be created for the stereo album. Although this was common practice at the time, it subsequently fell out of favour and so the song is presented on CD in mono. Ironically, the original mix of 'Only A Northern Song' was never used because the mono LP was created during the cutting process by simply combining the left and right channels from the stereo master tape. Consequently, this previously unreleased mono version can be heard for the first time on CD.